Any snippets or excerpts I post to this blog from any given day’s writing to whet my reader’s appetites are not guaranteed to show up in the final product. They may be altered out of recognition or edited out all together. A week ago I ran into Christmas and the book project went to sleep. Whenever I put it on hold I’m always fearful that it will be hard to pick up again. Today although I only had about five hours, two in the early morning and three just now, that proved not to be a problem. I’ve cranked out seven very rough new pages. I’ve not added any new pages since the last BI post. I have put in considerable time digging trenches. I’ve tentatively developed a string of prospective chapters – 60 plus with titles. If I’m to keep this below 300 words I’ll have to keep them averaging about 5 pages in length. That’s a good size for me. 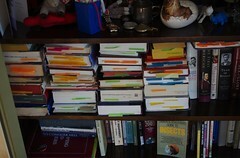 I’m leaving space for a glossary, bibliography, endnotes and index. These won’t count in my self imposed page limitation of 300 pages. I’ve applied a half dozen possible titles to the Book over the past several years. Its still untitled. The tag at the bottom of all the Book it posts should read Rat’s sacrifice. That part of one possible title however, when I typed it in I gave it the singular possessive spelling. It should be plural possessive. I edited some of the contents of one chapter yesterday and added another page in the process. A few months ago this was still a daunting process. Today it doesn’t seem so. I still have lots of reading and file shuffling ahead of me but I can now see the horizon. Once I’ve finished digging the trenches I should be able to go over the top and knock out five pages a day. That might not happen until Februrary but even before then I’ll keep cranking out a few pages every couple of days. I have a new respect for historical writing. Fiction is unmoored from the requirement of laying evidence out. Its like the stuff Rush Limbaugh spews out. I just won’t be able to count on “dittoheads” to buy my book. He had already had a couple odd experiences in 1977. In January a close associate of Duluth’s food magnate had called him to a meeting at the Buena Vista Motel about possibly investing in the _ _ _ _ _ plants. When he arrived he found the meeting had been set up in a janitor’s closet rather than a conference room or the restaurant. PS. I put the apostrophe in the wrong place in the category I’ve affixed this to. I think it should be “Rats'” That’s plural possessive isn’t it? I finally got that good night’s sleep. Cranking out ten pages should have been so easy. I put in my time. six hours this morning and two tonight just before nighty night. I just didn’t spend that time writing so, sorry, no unedited excerpts to share. The first post you saw in this series that I simply titled “Booking” had a picture of my room as my back faces it while I type. (I haven’t shown you the folders and pictures on my front and side walls. This project is eating me alive) Well, the two by three foot timeline hanging in front of my bookcase just didn’t cut it. Putting it together is what prompted my latest outburst of writing but it was so inadaquate to the ultimate task that I spent my time today creating a really practical timeline. At least I got a start on it. There are tons of dates and events to pencil in. The new one is just as wide but eleven feet long. Its like a piano roll (for you antiquarians) and I have it looped around a dowel so that I can pull up the dates I need to refer to. I’m a very “spatially” inclined writer. I like to have a strong visual sense of the things I’m trying to understand. My greatest fear is that having set aside the work I was churning out like gangbusters two days ago might cool me off to the point of inertia. I’m not too worried about this but its happened before over the six years I’ve worked on this project. If you are dying for intelligent political commentary I’ll one again point you to the Daily Dish. Andrew Sullivan does employ a few unnecessary naughty words but they are a small price to pay for one of the most intelligent filters on the Net. He’s got several hundred thousand regular readers and they are a smart bunch. No one who offers analysis, no matter how dead on it seems, can stand long before someone else chimes in who knows even more. Its no longer Sullivan’s take that draws me to his blog. Its the very smart readers who contribute. At my best I can write a pretty good blog post but even my best is pretty run of the mill compared to the incisive stuff available on the Daily Dish. Hell. Eighty percent of my non-Red Plan posts are pilfered from or riffs on what I read there. Oh yeah. I was going to let Claudia decorate that tree today while I wrote but I needed to buy color markers for my timetable so I picked some up while she bought enough ornaments to fill in the tree. It is pretty honking big Kind of like an elephant in the living room. That led to lunch and then I decided to spend a couple hours turning it from a plain Jane to a Christmas tart. Here’s a snippit of today’s writing. Three and a half pages. Once again I awoke at an ungodly hour and couldn’t go back to sleep. The same caveat applies to this as in yesterday’s post on the subject. This may get edited or removed from the final product. As a chronicle of the writing of the book while its being written I would like to say in today’s post that although my output is modest today I was very pleased. Had my grandson not awoken at 5am and called out for fifteen minutes until I attended to him I could have kept writing for hours. From the moment I began writing I knew exactly how to put my complicated story together. I know its complicated because this evening while recovering from a hectic weekend I spent nearly two hours confusing my better half about a single slice of this story. I told her that writing this would either help me stave off dementia because of its intellectual demands or hasten it. This was a particularly important chapter – the very first one. I’ve been reluctant to proceed on it for months because it must thread together many other slices of the story without losing the reader. I think I’ve figured out how to do it. I’m praying for a good night’s sleep. It would be the first in three days. If I get it there’s no telling how much I’ll get done tomorrow. Ten pages would be a miracle. Claudia says she’ll spend the day decorating the tree I hauled in with the grandson on Saturday. While I told her about the book she kept staring past me at it and whenever I paused she would repeat in something of a daze, “That’s a really big tree.” When I brought it in she told my daughter that she would never again let me go and pick out a tree without her. Come to think of it that may why she had such a hard time following me tonight. Anyone who doubts my ability to put words together should remember that over the past five or six years I’ve probably strung 2 million of them together for this blog. I say that because the book I’m working on should be my highest non family priority right now. Sure, I’ve got a long frustrated political ambition and I’m using the writing of the book to drum up interest in both but its still a book that may never see print. The more I blog between now and May the more difficult it will be to meet that deadline. So, like last night’s final post this one’s also about the book. I’ll continue to use this blog to flog the book and to shame myself to keep writing it and to back off of the blog. To that end I’m going to start enumerating the pages I’ve cranked out daily, I’d like to crank out about 25 (rough draft) pages at a time preferably once every two weeks. I really have no idea how many pages will be in the final book. To get anyone to read it it should be the size of a summer read or about 200 pages. At 25 pages every two weeks it would only take me two months to finish a rough draft. The first problem is that my typed 25 pages probably only equal about 12 paperback book pages. That means I’d need more like four months to come up with the full 200 pages. A second problem is my suspicion that to fully flesh out the story I’ll need more like 400 pages. That’s not a summer read and it would require closer to 8 months of work, not counting editing. I’ve spent entirely too much time blog posting this morning. Yesterday when I posted very little I got a good six hours of reading in. When I look at all the records I’ve been pouring through it almost makes me despair of ever finishing let alone before candidate filing. Everything on the floor is for the book including the low shelves to the right – Everything! 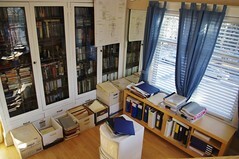 The timeline hanging against the book shelf in the upper right hand corner is one I finally put together yesterday. To put my research into context I’ve had to do a lot of reading. These books (I’ve bought every one that I found useful) (Oh, except for five or six Craig Grau loaned to me) lying on their side with yellow slips in them are ready for footnoting. I took two books with me to San Antone. The first was Pox Americana by Elizabeth A Fenn. Its a very interesting investigation of a smallpox epidemic that circulated all over North America during the Revolutionary War. I skipped over some of the middle chapters.Â They were a little too thoroughÂ in describing the various routes by which different groups of infected soldiersÂ took the disease to uninfected regions. Consequently, I won’t add the book to my list of completely read books. I did finish most of the later chapters however. I was particularly interestedÂ in the ebb and flow of the plains IndianÂ tribesÂ and the impact Smallpox had on them. I was also interestedÂ to learnÂ about the brutality of the Russian fur traders. The native Americans along the coast suffered tremendously from the pox. I also began Misquoting Jesus by Bart Ehrman on theÂ flight back. The first two chapters were well written.Â I had recently read a fairlyÂ dismissive critique of Ehrman.Â The critique found little faultÂ with the first four chapters of his book but battered him on the rest of the book. I’ll reserve my judgement.